There are usually three different service opportunities from which students may choose, and we always try to shuffle in a few new ones so that people can branch out a little more. Some of the ones we’ve done multiple times in the past include picking up litter at local parks around Fayetteville, cleaning classrooms at elementary schools as part of the Head Start program, gardening at Tricycle Farms, cooking and serving meals for 7 Hills Homeless Shelter, cleaning kennels and playing with animals at the Human Society, and volunteering at the Fayetteville Public Library. 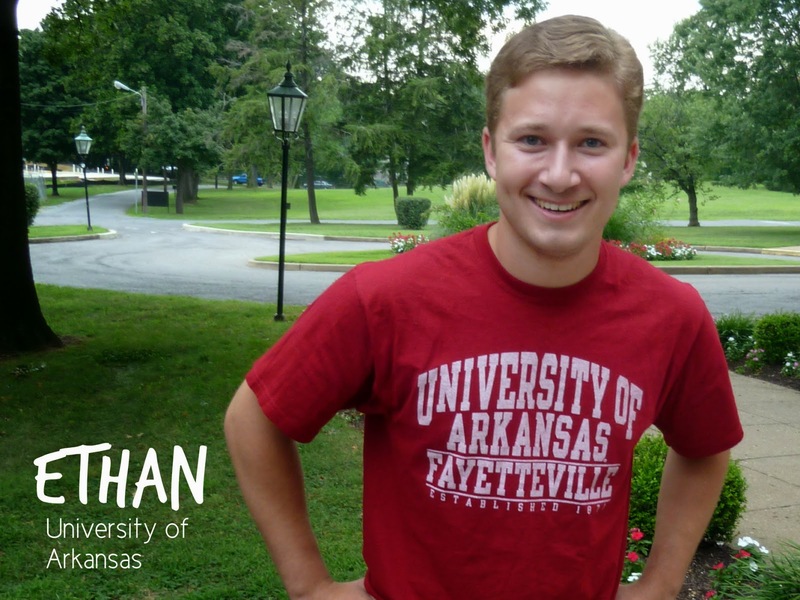 Ethan serves his community of Fayetteville, Arkansas. On a recent service day, I went with a group of fifteen students to do some work at Tricycle Farm, a sustainable farm in Fayetteville that helps provide food for some of it’s lower income residents. On this Service Saturday we spread some would chips to help redirect water away from undesired areas, while another group turned the compost. Once that was finished (we were able to move through projects quickly because God had graced us with a larger number of people) we began moving a pile of brush to make room for some potatoes that are soon to be planted. We also spent about an hour at the first annual Fayetteville Seed Exchange, which promoted local residents planting their own gardens. We had two other groups serving that Saturday. One group cleaned the oven in the kitchen at St. Thomas before heading to Planned Parenthood in Fayetteville to pray as part of the 40 Days for Life. Another group picked up litter and spread mulch at Walker Park. Michael, one of our volunteers, truly relishes in this type of work because he is very passionate about sustainability. He has planted a small garden at St. Thomas and began a compost pile. Michael loved the Seed Exchange and I’m pretty sure he talked to everyone he could while he was there. He also picked up a bag full of seeds to grow in our garden at St. Thomas, and I’m sure we will have plenty for the coming season. For the four years I have known Michael, I have seen his passion for taking care of the Earth that God has given us, and through him I can see Christ’s love for us. I enjoyed working at Tricycle Farm this past Service Saturday. I have volunteered there a few time over the years with St. Thomas, and there’s always something new for us to do. It’s also amazing to watch it expand as it has these past few years, because the larger it grows the more people it can benefit. Also the owner is breaking ground by getting more people in the community involved, which can be seen by the first annual Fayetteville Seed Exchange. I think it is important for the Catholic community in Fayetteville to support people like this who are helping the lower income residents of the community at large. Service is selflessly giving of time and effort to spread Christ’s love by example. As Catholics we believe it is necessary to do good works to complement our faith in Jesus. Ethan Guffey serves as a Campus Recruitment Associate for the University of Arkansas, a program sponsored by Catholic Volunteer Network and Catholic Extension.